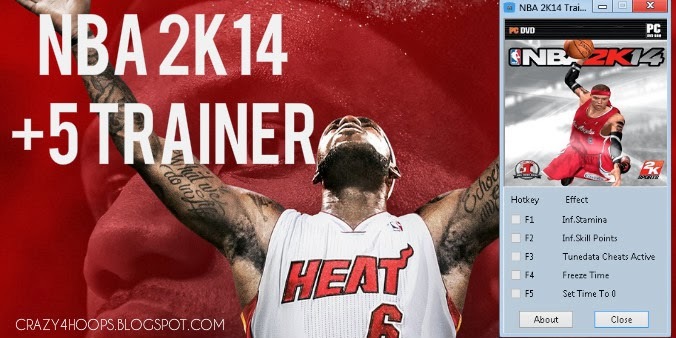 This is a trainer for NBA 2k14 PC. By this you can get unlimited skill points, freeze the game time, end the quarter of get infinite stamina or higher accuracy of everything! This trainer works in MyCareer mode and as well as in Quick Game / Play Now, Association, Blacktop and other modes. Run the game and then the trainer and press the required hot-key. Any problem, ask in comments. F1 Unlimited Stamina. No fatigue effect. Your player will not be tired even if you sprint all game long. F2 Get an infinite amount of SP (999,999,999 SP) for your MyPlayer. F3 Tune Data Cheats: Higher chance of pass, steal, and shooting percentage for your controlled player, whereas the CPU gets lower %. Also, reach-in fouls are less likely to be called. F4 Freezes the current time, but not the shot clock. NBA 2K14 Official Next-gen Trailer : OMG!